1. Cook the pasta and peas according to pack instructions and set aside. Pre-heat the oven to 200C/fan 180C/gas 6. Fry the mushrooms with a knob of butter for two minutes and spoon onto a plate. Fry the chopped bacon for a further four minutes and leave to one side. 2. Melt remaining butter in the saucepan, stir in the flour and gradually add milk. Increase heat and bubble the sauce until thickens. Stir in most of the cheese. Alternatively, to save time, use a 600ml jar of basic cheese sauce. 3. 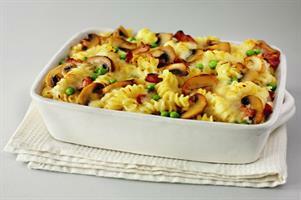 Tip the pasta, mushrooms and bacon into a large ovenproof dish. Pour over the sauce and mix with peas. Top with remaining cheese and bake for ten minutes until golden brown.